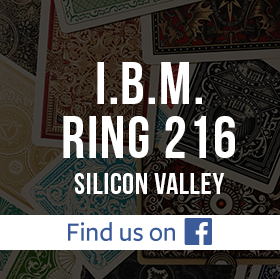 On November 8, IBM Ring 216 will hold its yearly election of officers. This is an opportunity for Ring members to get involved with the leadership of the club. Officers have a vote in the club's direction, provide a valuable service, expand their social networks, meet new magicians, and have fun. All paid Ring 216 members are invited to submit their names to also be considered as a nominee for any of the above positions. The deadline will be October 31, 2017. Candidates must be 18 years or older. In addition, any Ring 216 member can challenge final nominees by a floor nomination at the election. Ring membership and qualification must be validated at the election to be nominated as a floor candidate. If we have more than one nominee for a position, then a secret ballet will be held to determine the winner. For inquiries, contact Fred Rasmussen at fredemail@comcast.net or Cal Tong at calvinloutong@yahoo.com, or send email to both of us at nominating-committee@ring216.org.